Absent from the Boston Marathon for three years, 2014 called me back. This race is so much more than the race. 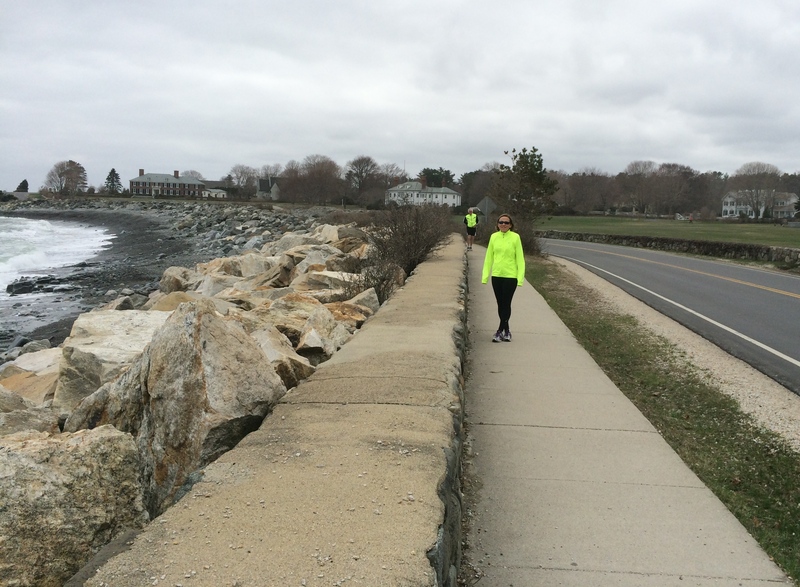 Our approach to the big weekend was a measured one, enjoying an ocean-side run along the New Hampshire coast with friends. The day ended with a beautifully prepared late-night dinner where we reluctantly left the table just short of midnight. Avoiding the hassle of driving in Boston, a morning that came too early found us catching the commuter bus from Portsmouth to South Station. After a luggage drop at the superbly located College Club of Boston, we made way through packet pick-up without a wait. How do they serve 38,000 runners with that efficiency? The Expo was well spaced with lots of new products and a few celebrity runner sitings. 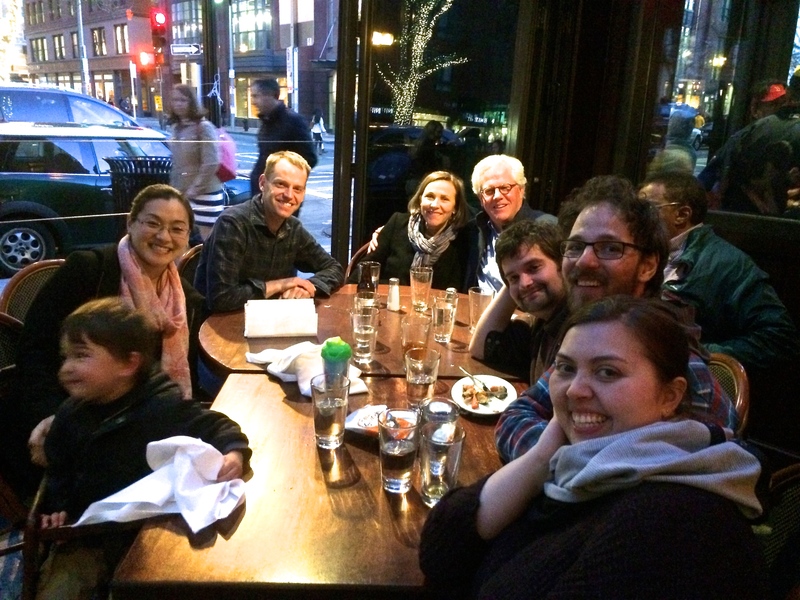 With a Monday race day, Saturday evening is traditionally my time to gather up my Boston-based friends and catch up over dinner. This year, we chose Joe’s American Bar & Grille, casual with delicious selections and local favorites. Macaroni and cheese with lobster was my choice and perfect to keep the carb count building. An after-dinner walk on Boylston Street, closed off to traffic, became a promenade with hundreds of people, runners, families, locals, mulling around the finish line. There was a sense of serenity in that evening crowd, a feeling that can only follow the deepest of pain and loss. The day before any marathon, and this one in particular, is my day for quiet and contemplation. After a brief shake-out run in the Public Gardens, a service down the street, a light mid-day lunch/dinner and the ritual laying out of race morning clothing/bib/Garmin, I hunkered down for the day. A 38,000 runner race, and I walk right into several of my training partners enroute to the bus lineup. Arriving in Hopkinton, we settle in until our corrals are called. My thrift store halloween fleece fit right in and was left at the start for pickup by Big Brothers Big Sisters. With an 11 a.m. start, temps were a bit warm as I topped a hill near Mile 15 and spotted friends and family. Interesting that I could tell myself my body was aligned. The camera tells the truth: I was curled up like a comma. Continuing on through the hills somewhere around Mile 18, One Run For Boston‘s Danny Bent is suddenly on the course wrapping me in a hug. I see several runners with cramping legs and other difficulties. Not wanting to join their ranks, I maintain an even pace, continue to drink water and munch on the clementine stashed in my pocket. At mile 21, I remind myself it’s downhill and flat from here. I can feel the heightened emotion of fellow runners and hear the increasing volume of the crowd as we make the turn onto Boylston. I finish at 4:39:21, a BQ (Boston Qualify for my non-running readers) with 39 seconds to spare. A quick shower and check-out and we’re headed through Boston traffic for a comfort food dinner New England-style at Petey’s. Broiled scallops and the very best coleslaw made for a perfect post-marathon meal. Thank you Boston, thank you friends, thank you supporters of One Run for Boston. It’s time to go home. 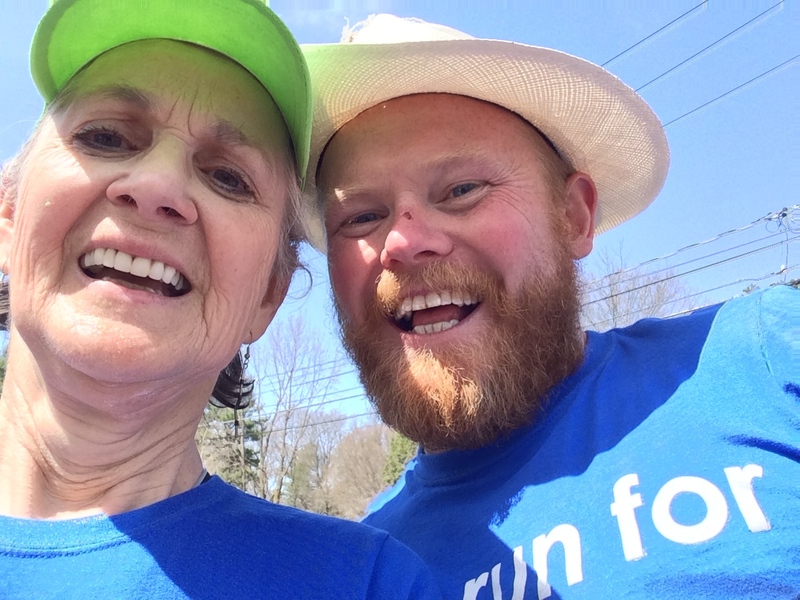 I love reading people’s first hand experience from Boston – I hope to run one year. Congratulations on a great race! Thanks, Betty. I love reading other’s first hand experiences as well. I’ve read several and find it interesting how our experiences and perceptions can differ. I hope you run it one year as well – let me know if that works out. great race recap, and a great race, to boot! Nice job! Thanks for letting us enjoy the marathon with you. Sounded like a perfect weekend. My pleasure. 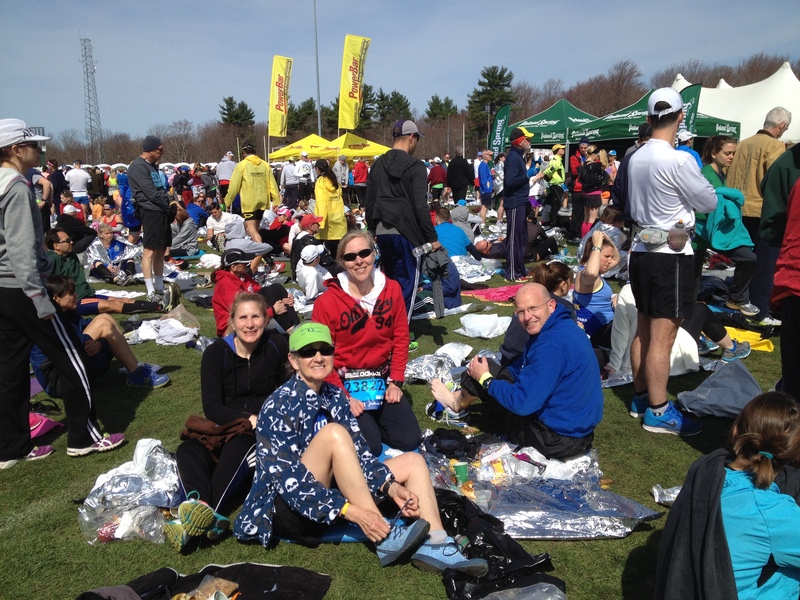 And, yes, a sense of cohesiveness, good friends, good running – a perfect weekend. Thanks. Appreciate you stopping by. Astounding that you can push your body this hard. And even more impressive that you have the grit to do it. 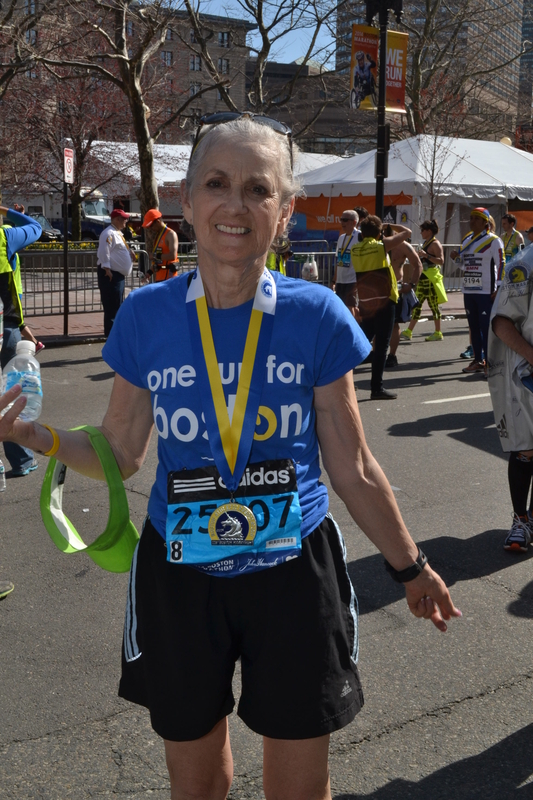 Congrats on running your peace, Marylou! Thank you for naming it. I am in fact running my peace. So impressed by your stamina and your positive attitude. You’re in inspiration to all of us. And thanks for the vicarious pleasure of following along with you! You’re welcome. Dinner company was the best. Congratulations! Sounds like it was a wonderful experience! Thank you. And you had your own wonderful experience at London. Great job. You are, as always, an inspiration! Congrats! Thanks. See you in New York. Jim & I have nominated you for the Liebster Award. It’s for bloggers to nominate other blogs they enjoy reading that have a small following. Terry & Jim, thank you. Fair warning – it may be a month or two before I get back with any response. Happy summer running! 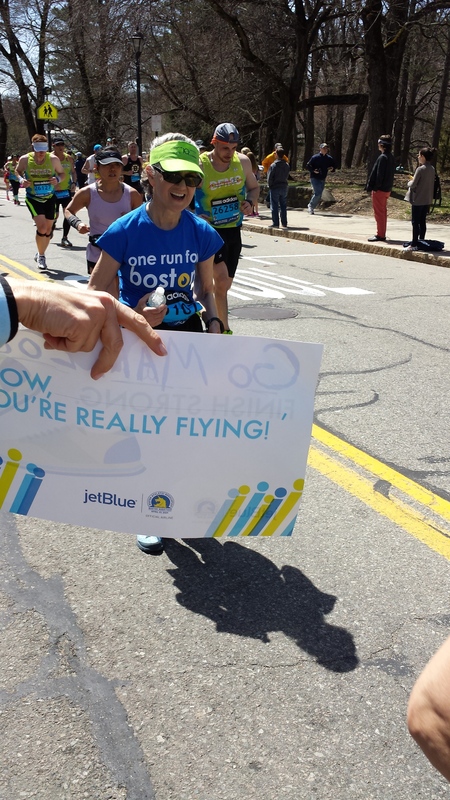 It’s been fun reading everybody’s Boston Marathon recaps lately! Congrats on BQ’ing again! I’m enjoying the Boston recaps as well. So many different perspectives from runners at the same event.